Great dental office. Been going there for 10 years. Wonderful staff and a dentist that cares. Great with my kids too! My daughter and I both see the dentists here. By far the best in Sacramento. My daughter had a toothache the other day and needed 3 baby teeth pulled. Needless to say it was very stressful but the friendly staff made the visit go seamless! I really appreciate the friendly atmosphere. Also, the dentist took the time to explain what needed to be done and we were not rushed. Thank you so much for taking such great care of us! The Doctors and staff are the best! My kids and I have coming here for years and always given great service! This place is great. Me and my family have been coming here for many years. Dr dang and staff are very nice, professional and accommodating. I will miss them . Don't know where I'm going to go when we move! This dental office is simply awesome. I was with my previous for over 5 years and they have never went out of their way to help me when it came to looking for a specialist for my daughters. The Dentist and her assistant was very helpful. The dentist did research for me and they called back the next day. I'm very grateful that they are so caring even though we were not even their patients yet. I will finish up my dental work with my current dentist and move my family to them. What a great team and first impression. Majestic Dental has always been a place I can rely on. The wait times are short and the staff is always friendly. They also help with reminders with each appointment are a few days before to check up. I am a 32 year old man. Who is extremely afraid of the dentist. I started coming here two years ago. I've worked with both doctors. They are as kind and gentle as they can be. Even the other staff that are on hand,naming Gabi and melanie. As you walk in and become more of a regular customer , these two ladies will greet you at the door. As a matter of fact by first name. Absolutely the best. From the moment you walk into the office you're treated like royalty. The dentists, the dental assistants and the office staff are all very warm and caring. You'll look forward to your visit, as much as possible. I have been going here ever since I was a kid, so around 7 years. Everytime I come in for a checkup Dr. Dang is nice and the people up in the front. I honestly hate going to the dentist but going here is different. They are quick and efficient and does not leave patients waiting for too long. Dr duong and to the girls at the front desk I appreciate you all. First I have to admit that I become a scared little kitten when it come to going to the dentist due to a bad experience when I was a kid and always been scared of them since. For the longest time I've been looking for the right dentist and let me tell you it's just like finding the right car mechanic shop ,total disaster ! Finally I've found my spot!I mean I found my spot!!!!! "I'm going back back back to majestic dental "
My wife, kids, and I have been patients at Majestic Dental since we moved to the area in 2015. 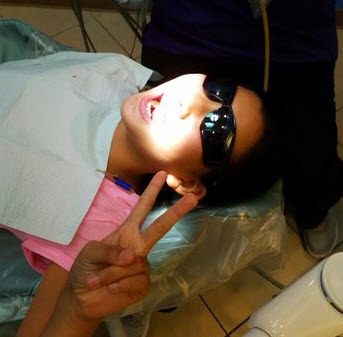 Both Dr. Dang and Dr. Duong are amazing dentists who go out of their way for service. Their staff is also amazing as well, very professional and sociable. I've had issues with my youngest daughter and her visits to the dentist; she was terrified. She needed major work done--multiple fillings and a crown. We scheduled the initial appointment with Dr. Dang and it went very well. They ended up extracting a tooth, giving a few fillings, and placing a crown. It was a lot of work and Dr. Dang and her assistants were very accommodating to my daughter. They kept her calm and made her feel very comfortable. She loves going back. I've had multiple issues with my insurance company (very typical for Tricare MetLife) regarding on and off coverages and the staff was extremely helpful and accommodating for that as well. They are very patient and always follow up within a fast timeline. Melanie, Lily and Kathy have always been very considerate and helped fix the many issues with insurance. I will continue to come to this office because the service is amazing. Doctors do such amazing work. My entire family goes to this practice. The multiple phone calls are annoying but, that's not a reason for me to stop coming here. I've been going here for years and the experience is always top quality. From the receptionist experience, friendly dental hygienists, and Dr. Shannon Dang, I've always a great experience and squeaky clean teeth! Thank you! I went with a groupon for dental cleaning and x-rays. Every employee I met was pleasant and helpful, without a saccharine affect. I appreciated that the dentist took time to teach me proper electronic brushing and flossing technique like no other dentist has before. They didn't pressure me into getting extra services when I let them know what I came in for. If I lived in Sacramento I would visit this dental office for all my teeth cleanings.